Yuge storm overnight continuing into today. About a foot to a foot and a half already dumped with more coming down. Anyone else think this might be signs of an early season out west? It has been really cold and miserable here lately, so definitely a chance. But sunshine is still just predicting a Nov. 9th opening day. In the past its mostly been around the 7-9 iirc. I think it's the start of ski season in Calgary for sure. BTW Oct 1st was the official day one of 400 world wide. I've already missed 2 days because I had to work. Don't be like me OP go skiing now! Panorama this morning, there’s loads more at the summit. We start snow making in 10 days, might not need to bother at this rate! I live in Cochrane OP. It's currently sunny at 1 degree and should have highs of 5 until Sunday :(. It's looking pretty average for the rest of the month tho. I'd bet this season will be right on time. been spotting some urban spots, hard to hit urban when your friends are pussies. I'm in red deer ab, OP if the snows still there by Friday lets smash some urban. I'll make the trip in. saskyskier71 I'm in red deer ab, OP if the snows still there by Friday lets smash some urban. I'll make the trip in. my buddies were talking about marmot for opening day and I didn't believe it. wasn't down to slide on rocks. 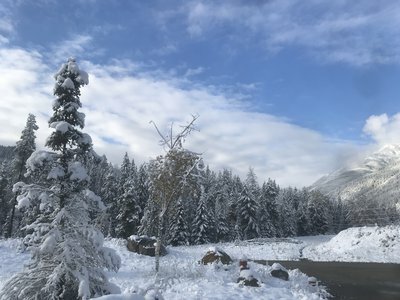 didn't think marmot got much early season snow. saskyskier71 my buddies were talking about marmot for opening day and I didn't believe it. wasn't down to slide on rocks. 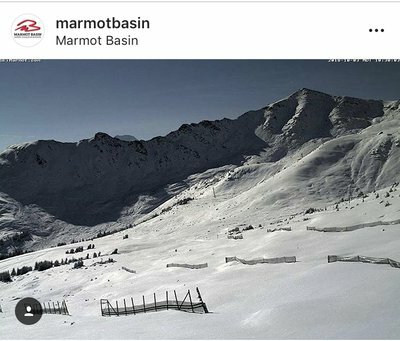 didn't think marmot got much early season snow.